War. Several years ago I wrote a short piece about a cousin, a soldier who fought there. I thought I would republish it. When my son asked me to write about the Zulu wars for the letter Z of the 2014 A to Z blogging challenge, I found a second cousin four times removed, Henry Germain Mainwaring (1853-1922), who served in the Zulu war of 1879. Henry Germain Mainwaring was a Lieutenant in the 2nd Battalion 24th (2nd Warwickshire) Regiment of Foot. He sailed for South Africa on 2 February 1878 and was there until 20 December 1879. From 20 January 1879 the 24th Regiment was camped at Isandhlwana, an isolated hill in the Zulu kingdom in the east of Southern Africa. B Company of the Second Battalion had been left to guard the stores and hospital at Rorke’s Drift ten miles away. Rorke’s Drift was a mission station and the former trading post of James Rorke, an Irish merchant. 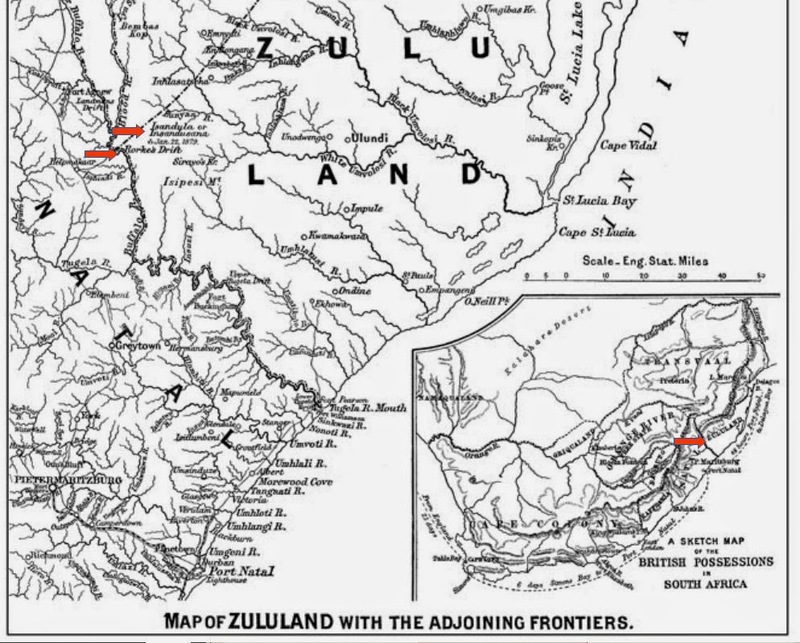 It was near a ford, known as a drift, across the Buffalo River, which formed the border between the British colony of Natal and the Zulu kingdom. On 22 January, Lord Chelmsford, British Commander-in-Chief, took the second battalion of the 24th, with the artillery and some of the Natal Native Contingent away from the camp to seek battle with the Zulus, who had been reported to be south-east of the camp. 1,800 British and Colonial troops were left in the camp including 585 men of the 24th Regiment, the only British regular infantry regiment among them. While Chelmsford was absent, the camp was attacked from the north-east by a force of Zulu warriors, said to number 20,000. Of the 1,800 British forces, about 300 survived. These had fled south-west across the Buffalo River; of the 585 men of the 24th only ten survived. 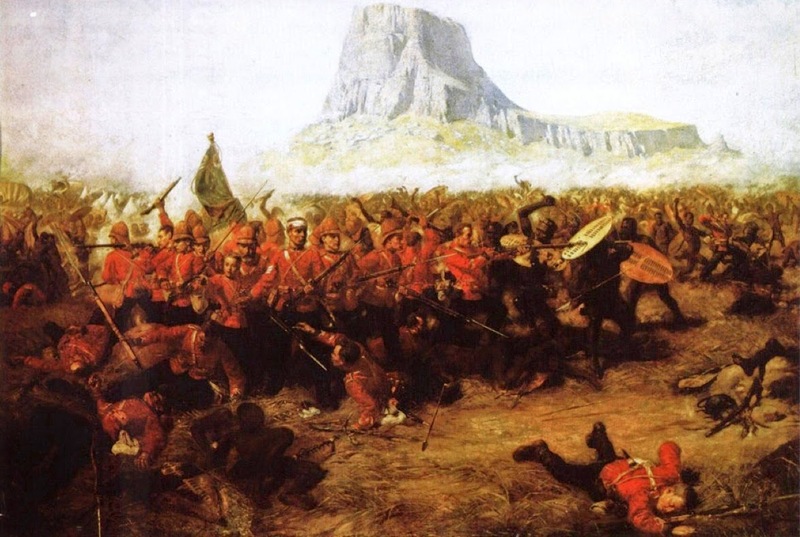 The Battle of Isandlwana, 22 January 1879. Charles Edwin Fripp (1854-1906), 1885 (c). A small band of the 24th gathered in a square around their Regimental Colour. In the aftermath of the battle there were several groups of bodies found which indicated that men had gathered themselves together to fight to the last. In the background rises Isandhlwana Kop which, significantly, is shaped like a Sphinx, the badge of the 24th. Henry Germain Mainwaring, a Lieutenant in F company of the 2nd Battalion of the 24th Regiment was among those with Chelmsford. The mission station at Rorke’s Drift was attacked by several thousand Zulu warriors on the afternoon of 22 January and the battle continued overnight. 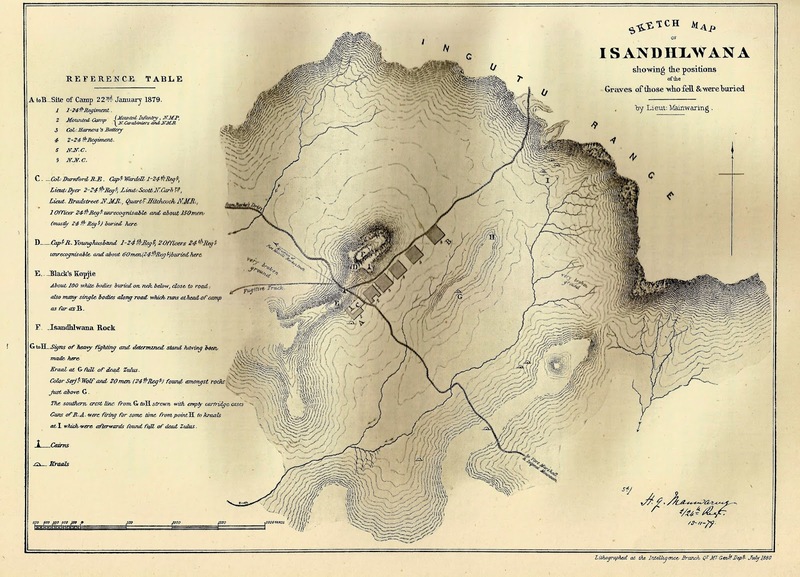 140 British and colonial troops, including 36 men in the hospital, defended the garrison. Chelmsford’s troops arrived at 8am on the morning of the 23rd. Seventeen British soldiers had been killed, ten wounded, and 450 Zulus had been killed. The battle was reported around the world. In New Zealand, in the Otago Witness of 22 February 1879, Mainwaring’s name was listed as one of the officers of the 24th Regiment which had been in the battle and “almost completely annihilated” in the “massacre”. The remainder of the 24th cleaned up after the battle and buried the dead. Mainwaring made a map of the battlefield showing the graves of those who were killed and were buried. Mainwaring received a medal and clasp for the South African Campaign of 1877, 1878, and 1879. He was promoted to Captain in 1880. In the First World War he served as a Brigadier General. UK National Archives WO76/233 South Wales Borderers (2nd Batn). Descriptions relating to individuals have been created using information from a nominal card index relating to Army Officers’ service compiled in the 1980s. David, Saul. “Zulu: The True Story.” British History. BBC, 17 Feb. 2011. Web. 27 Apr. 2014. <http://www.bbc.co.uk/history/british/victorians/zulu_01.shtml>. “24th – Anglo-Zulu War 1879.” 24th, 2nd Warwickshire, Regiment – Fact Sheets. The Royal Welsh Regimental Museum Trust, 16 July 2012. Web. 29 Apr. 2014. <http://royalwelsh.org.uk/downloads/B05-01-24th-Anglo-Zuluwar1879.pdf>. Luscombe, Stephen, and Charles Griffin. “The 24th Regiment of Foot.” British Empire: Armed Forces: Units: British Infantry. Britishempire.co.uk, 7 Nov. 2013. Web. 29 Apr. 2014. <http://www.britishempire.co.uk/forces/armyunits/britishinfantry/24thfoot.htm>. “The Battle of Islandlwana.” Zulu War. Britishbattles.com, 10 Apr. 2014. Web. 29 Apr. 2014. <http://www.britishbattles.com/zulu-war/isandlwana.htm>. The link to the article about the Zulu war of 1879 was interesting reading. Yes http://www.bbc.co.uk/history/british/victorians/zulu_01.shtml raises some good issues including that Rorke’s Drift is well remembered but it “was fought on the same day that the British Army suffered its most humiliating defeat at nearby Isandlwana. Why? Because it suited those responsible for the disaster to exaggerate the importance of Rorke’s Drift in the hope of reducing the impact of Isandlwana.” And “few emerged on the British side with any credit, nor did ordinary Zulus benefit. ” My cousin was lucky to be absent from Isandlwana for the battle.